Over the past two months, it’s been so fun to be able to give you a peek into how our downstairs has slowly been transformed by the addition of our beautiful Mohawk laminate flooring with a hand-scraped look. I can’t begin to tell you how fresh and clean the entire home feels, and while the photos show the dramatic difference, seeing it in real life takes the before/after to an entirely new level. A video crew joined me last weekend, and we spent time in the kitchen shooting some fun, upcoming clips. After an entire day of dragging equipment around our place, the director noted our “hard wood” flooring. When I clarified that they were laminate, she determined that no one would ever know the difference. Yes, in real life they are that convincing. Since you’ve gotten to see the before and almost after shots of our living room and kitchen, I’m now taking you into our “great room.” As you can see, the kitchen and this area are one elongated living space. Life happens here, and this is the room that I spend the most time decorating and changing up. Initially, you could see the great divide between the old vinyl in the kitchen and the carpet in the great room. Now, don’t roll your eyes, but when we built the house, I purposely chose white carpet for this room. I know you are wondering what I was thinking since I had 3 children under the age of three. Many determined me insane for making that decision, but I wanted the light, airy feel. Honestly, for the first eight years, I didn’t regret that decision. The carpet stayed beautiful because of my no shoes policy, and I was quick to wipe up spills. But as another nine years passed, our 4th and 5th children were quickly added to the mix, along with an indoor dog, and the white carpet turned to off- white. In the highly trafficked areas, the white turned to light tan. For years, I had no area rug in the center. It was the main wrestling area, popcorn and movie eating spot, and many forts were built in the middle of that great room. But, as more spills occurred, they needed to be disguised. I didn’t have the benefit of Mohawk’s Smart Strand Stain resistant carpet back then, so adding an area rug was a great option. What I came to realize were the many benefits of a beautiful area rug. Area rugs aren’t just for covering up stains. Yes, they add protection to one’s carpet, which was my initial goal, but they also warm up a room dramatically both in appearance and practicality. They are incredibly versatile. They can add a pop of color and change the whole feel of the room instantaneously without having to completely redo one’s flooring. Even though I knew that our carpeting needed to be pulled out, there were other home renovation projects that took priority. I decided to switch out my existing smaller area rug to this large Mohawk rug. I picked the fun, colored polka dots with our third story attic floor in mind, but knew it would be perfect in our great room until our new floors arrived. This fun carpet and rug ensemble not only warmed up our entire downstairs; it also gave this area such a cozy feel. It defined the room and allowed me to love that space again. But, no matter how many times I ran the carpet shampooer along the outskirts of the rug, the original carpet needed to go. Remember, we had it for 17 years and definitely got our wear and tear out of it. I have shared previously how the debate escalated in our home over whether we should replace the old carpet with new carpeting in this room. 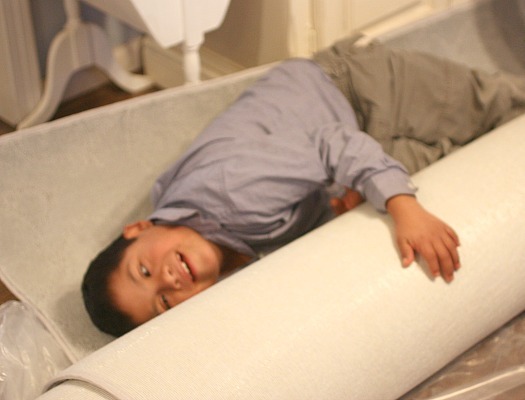 Our kids didn’t want to lose the warmth and cozy factor that carpet provides, and I was leaning that way as well. We lay around all the time in that space and yes, the big boys even still wrestle there. But, after a huge disaster that came about from a dog and a box of chocolate cake mix, I knew I couldn’t go back to carpet in that room. Once I promised to bring in a large, cozy bound carpet that mirrored the beauty and warmth of our existing carpet, they agreed. We enjoyed the polka dots for a few more weeks, but when the new Smart Strand bound carpet by Mohawk arrived, the change defined our new space and pulled the entire room together. It’s incredibly elegant, and the light color I chose (yes, I went light again) has such a rich contrast against the darker wood grain. 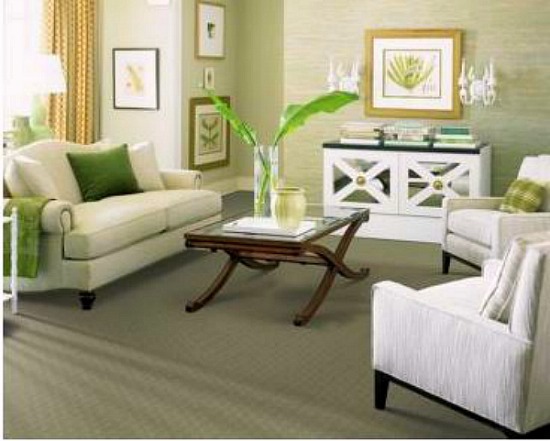 SmartStrand carpet is super soft and durable too. It also has lifetime stain and soil resistance that’s built into the carpet fibers instead of sprayed on, so I never have to worry about it wearing or washing off. Most stains clean with just water or mild detergent. 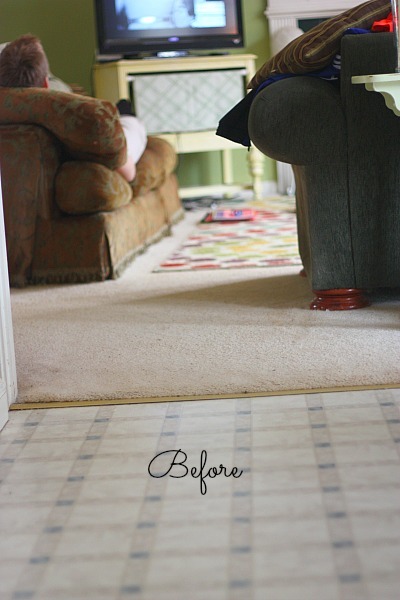 There have already been accidents, which came right up, not to mention that this is a prime example of how adding a bound carpet can change the entire look of a room. What I want you to see. My SmartStrand bound carpet serves as the perfect complement to my new laminate floors. With so many textures, patterns, colors and customizable sizes, bound carpets are a smart solution to one’s desire to update a look without breaking the budget. Look at them as a piece of art because they can add a dramatic difference to your room. When we took out the furniture too add the flooring, I gained a new vision for this room. While my plan was to add built- ins to either the dining room renovation (see it here) or our “sitting room” (my name for the attached French door space that has no function), I’m leaning towards building them here based on this inspiration picture. Our ceilings are 9’8”, so they are tall, and I think they need to go all the way to the top. I may ask for a bit of some design help with that large project since the off centered fire place throws me a bit, but this room will be breath taking. No, it is breathtaking. Now, as is!! I continue to remind myself that home renovations are a process, not an event. Don’t get swept up in these grand before and afters because the most enjoyable part of this journey has been to enjoy every single step of the process. I am so content and while I list my home goals for this room, and even forgot to mention replacing the lighting fixtures, I guarantee it will take awhile for me to get there. That’s part of the fun! I appreciate every new step. Now, it’s time for the best part of this post! Thanks to my partnership with Mohawk, I am thrilled to be offering one of their gorgeous 6‘ x 9’ Smart Strand bound carpets. Yes, one reader will get to work with your nearest Mohawk retailer and design a carpet that’s perfect for your space!! 1) Why do you want to win a Mohawk Smart Strand Bound Carpet? 2.) Follow me on Pinterest, and Mohawk Flooring and pin any of my posts to one of your boards. 4) Follow me on Google Plus and give this a thumbs up and Mohawk Flooring. This giveaway will close on Friday, April 11th at 11:00pm. A winner will be selected randomly and then have 48 hours to confirm. The flooring looks gorgeous! I can’t wait to see all your changes…you are so creative with your design! rything needs re-done and we can’t afford to hire out all the work, but the idea of waiting and enjoying the process is like a breath of fresh air! Just out of curiosity, how has the transition from homeschool-teacher-mother to NOT being a home-school-mother been for you? I have found it to be the hardest thing I’ve ever gone through. I am being challenged daily and have struggled with my identity for two years and still continue to struggle. So glad to “meet” you. It’ sounds like we have tons in common. I am still homeschooling our two daughters and our son is only going part time, so I haven’t completely stopped, but even with our sons making the switch, it’s been a challenge for sure. I’m curious about how you would design built-ins around the fireplace since it is off-center? Our living room is just like yours except instead of the fireplace being off-center, there is a window just on one side, not on the other. I’d like to win this carpet pretty much for the same reasons in your post….our living room carpet has been very well loved by my three small children. I want to replace with hardwoods and the only way my husband would go for that is if I had a nice area rug to put down. We removed the white carpet when we moved in to our condo and now have laminate floors, too. I still haven’t bought a rug for the space yet. I’d love to win!! We have been looking for a carpet for the living room area & haven’t found one yet that fits what we want. I would love to win this! I liked this post & shared it. We have 4 kids (ages 12-2) and also light “renters quality” carpet. A large 6×9 piece would be fabulous for our great room!!! I like your facebook page already. I would love it for our living room. Our current carpet has seen it’s better days, but we aren’t in a spot to replace it yet. I have always loved rugs over carpet. I like plush and layers. I would like to win new carpet because ours is getting tired in the main family areas/high traffic areas. Would love to win this for a friend. We are getting rid of his 70’s carpet and getting his house an over all updated look. I would love to have a bound carpet to go in my bedroom-the current carpet is around 20 years old and needs to be replaced and there are only 2 spaces left in the house with carpet (my room and an office/spare bedroom). Adding laminate to my bedroom feels “cold” however a bound carpet would add the warmth I need. We desperately need to update the living room. This would be a great place to start! Your new living room looks great, Jen! 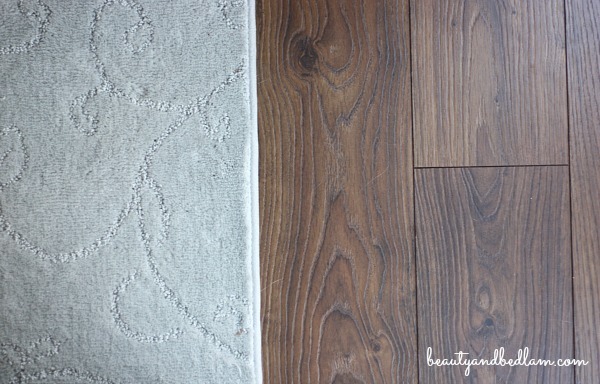 The color of your SmartStrand rug is beautiful against the rich laminate flooring. We just put in new hardwood floors and a mohawk bound carpet would be a great addition to soften the living room. I would like to win this carpet because it would cover a multitude of sins in the living room and it would help to convince my husband that its OK to put a rug over wall-to-wall carpeting! I want to want to win a Mohawk Smart Strand Bound Carpet because I LOVE your and I really need to update our eating area with a pretty new rug. Our hardwood floors are original to our 1940’s home sweet home and they need the ‘touch’ of a lovely bound rug to warm and beautify them! I follow you on Pinterest as (http://www.pinterest.com/sewnpretty/) , I am a FB friend, Google Plus follower and get your posts via e-mail. I also follow Mohawk on Pinterest and FB. So busy making sure that I enter the giveaway properly that I forgot to say ‘thanks’ and I love what you’ve done with your flooring! What a huge difference new flooring makes to any room! 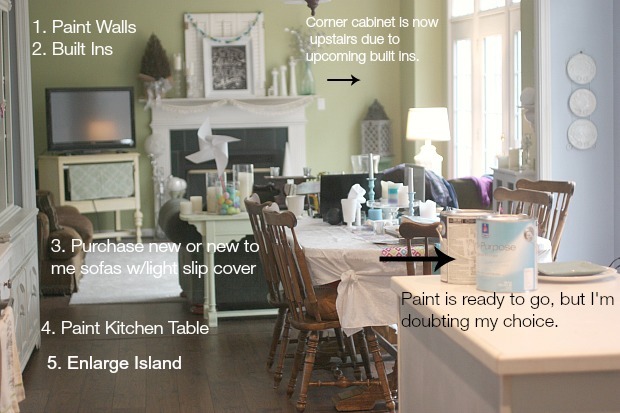 Your family room transformation inspiration picture inspires me to tackle our room projects one bite at a time and be content with the ‘meanwhile’ times! Sometimes I just want to do the whole thing at once and that’s never in our budget, but one step at a time is doable! Thanks! We are looking for area rugs for our family and living rooms. We need them for the wrestling matches between our four boys and Dad! I follow you on Facebook. Love your blog! My dining room is calling out for a fabulous Mohawk rug. A stain resistant one that won’t fall apart would be an added bonus!! Our carpet is almost thirteen years old. We even have carpet in our master bathroom! (It came that way, and we have yet to modify it). We are seriously considering wood floors and I love the look of your new bound carpet. The polka dot carpet is super as well! Thank you for your blog posts and inspiration! My carpet is over 25 years old. I can’t afford to replace because of medical costs for husband. This would just liven up my living room. I have new paint bought and ready to scrape an old popcorn ceiling. Wouldn’t this just top off the redo and quite affordable. Jen thank you as usual for all you do and inspiration. My mother replaced her 15 year old berber carpet in the living room with a laminate and the room is missing that warmth and comfort. She has a small rug that matches her couch but the room needs something to anchor it. One of our neighbours has a Mohawk rug and I was surprised by just how great it felt, so have started looking around at these. We desperately need several big rugs for the ground floor of our (new to us) house, but just haven’t got the money yet to be able to buy any (sad face). I like the warmth the carpeting adds to the room. That is what my great room needs. Thanks so much. I just love to follow your home improvements. I follow you both on Pinterest and pinned your post on picking out new flooring. I would love this because it looks like great quality. I have 3 dogs that can do a number on floors in my house. I follow you on Google+ and gave it a thumbs up. I follow on Google + and +’d this post. I’m already a subscriber and enjoy your posts. I follow you both on Pinterest and repinned. I love a new rug for our living room. Currently, we rent a home and are saving like crazy in hopes that we can buy one next year with a big down payment. Renting a home for the last 5 years means that updates to the home are just really not an option. A new rug would freshen up our living room and then we could bring it with us to enjoy in our next house as well! I have always wanted an area rug for my entry area…how exciting that would be to have one. Oh ten year old carpet is in need of a cover up. Please help! I Subscribe to Balancing Beauty and Bedlam by email! I’d love to win. Thanks for a great give away. My Golden Retriever ate a six foot hole in my berber carpet. That was 10 years ago. Every area rug I’ve used to hide it has not lasted. I love the carpet you chose! Thanks for the information!! I would love an area carpet to put on top of the original lemon yellow shag that is in my 1970’s living room. In fact, we window shopped the perfect Mohawk addition for my rug just last weekend at the store. I need to protect the old carpeting until I can afford to buy new, and the rug we looked at would be a great addition to the look of the room! I do receive your emails already. They are inspiring! we need an area rug in our family room to help protect the wall to wall carpet we have. already a long term subscriber!! I would love to win because my daughter’s carpet is so stained and worn. It was the carpet that was here when we moved in. We just don’t have the funds to redo her room right now, I would love for her to love her room. Mine really needs replaced, we had an aging dog that made several accidents on the carpet! My carpet is 20 years old, and we have 4 kids 4 thru 17. I’d enjoy sprucing up my bedroom for Spring with a gorgeous pop of color. I would love to win! We have recently moved to a new home and our den is hardwood. We need a soft, comfortable rug! Thank you for the chance to win a beautiful bound rug. We have all laminates here so the rug would really soften our living area. I want to win because my new-to-me house has almost white carpeting in the living room and with my kids, it won’t stay that way. I liked Mohawks facebook page too. My rugs are worn out. I follow you on Facebook also. It would be a true blessing to win this! My carpet in all rooms are so old and beyond repair. And I can’t afford to replace them anytime soon. Thanks for the giveaway! I liked Mohawk flooring on Facebook. LOVE the new changes. The area rug looks like it has a textured design. I really like it. I know you must be really loving the new look. I would love to get rid of my old carpet that has stains from past pets and all the feet that have gone through my house. 1. I follow you on pinterst. I would love to win a Mohawk Smart Strand Bound Carpet because we are in the middle of a bedroom redo. I’d love to win a rug like this for my dining room. I have been meaning to put down a rug under our dining room table for over a year but other expenses keep taking precedence. I’d love to finally be able to do it!! I love your new rooms and have been watching the transformation. I am moving into a new house very soon and really need a rug for our laminate flooring. I would love to win! We are getting ready to move and would love carpet/rug to go in our new house to update it with a pop of color. I have liked you Facebook page. I would love to win a pretty rug for my bedroom. All of the other rooms have rugs but I don’t have one in my room. We have hard wood throughout the house. The bedroom floor is cold and hard and really needs a rugs. We just threw our den rug away! Love having one to protect our hardwood floors, but more importantly our backsides while playing with our toddler and two labs!! I want to win a new pretty rug for our living room. We will be taking out the existing rug and putting in a hardwood floor. I want a nice vibrant blue to offset our couch. I follow you and Mohawk Flooring on Pinterest as cherylabdel. I liked Balancing Beauty and Bedlam’s Facebook Fan page ( and shared the post) and Mohawk Flooring on facebook. Would love a carpet that can hold up to the messes my two-year-old can make! I follow you on google plus as Cheryl Abdelnour . I subscribe to your email. Thanks. After years of planning and saving, we are finally getting ready to build a new home! We will have laminate flooring also, but I just love the warmth area rugs give to a room, so I’d love this! I follow you on Pinterest and have pinned several of your pins. I would love to win a carpet for my Living Room since it is such a long room and there was hardwood already but it is not a very cozy room. I think it would make it feel warmer in the winter as well. The cream/tan/gray, originally nearly white, textured berber in my great room is begging for an area rug! Three children (6, 4, 2, 5 weeks) and a lot of life happening have insured that. The area is open, for much safer recreation, so it’s an amazing place to showcase Mohawk. Also, with selling the house in the very near future and knowing the carpet cleaner’s best efforts won’t compete with the most stubborn stains, a rug has been on my mind but not in the cash-flow budget! 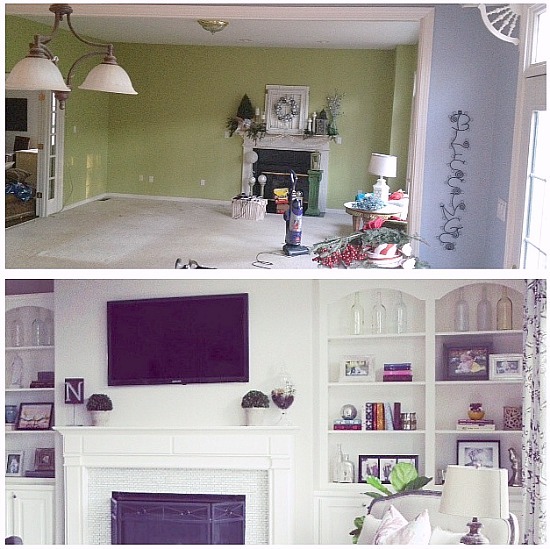 I would like to win so I can freshen up my family room for the spring and summer and out of town guests. 6 x 9 would be a great size for our room. I hope I have good luck!! I became and facebook fan of your page and gave the posting a like. I am an email subscriber also. I love your new updates, so gorgeous! I am in need of a new area rug with 4 kiddos running around. I’ve been looking at loose strands and I love the color selections you’ve displayed above. After losing our almost 16 year old beloved golden retriever this week, it is now time to do massive flooring replacement. I have known for some time that I wanted vinyl flooring with a bit of carpet for warmth. I LOVE seeing what you have done and it gives me inspiration to move forward! 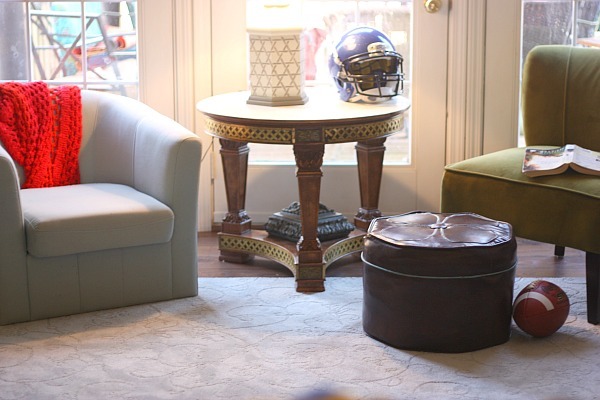 I would love to win a bound carpet, it would be perfect for our family room/great room! I am an avid subscriber!!! I need a new area rug because the one in our library is woefully too small! I would like to win so that I can do a mini facelift to my great room. I would love to add a stylish rug and new pillows. I love your new flooring and carpet. Can’t wait to see the room as you progress through the various projects you are taking on! I’d love to do something like that in my living room. After six dogs and 14 years, it’s looking pretty shabby…much like yours was…I’ve also put an area rug to hide most of it, but those edges still show and they look pretty gnarly. That Mohawk carpet sounds like just what we need in there. I have done all the required things to do…I was already an email subscriber and pinterest follower and facebook follower, so the rest was easy. I follow Mohawk Flooring on Pinterest. I would love to brighten up my living room with one of these! I would love to win a new area rug. We moved into a house that has laminate wood flooring. It is great as far as easier to clean up spills and keeping the dust to a minimum for my allergies. The only draw back is its hard! haha I’d love to have a softer place for our two kids to play, read, and enjoy a movie night. At one point we were given a rug but we had to pass it on to someone else because it shed so bad and became a choking hazard to our baby (at the time) who put everything in her mouth. Thank you for a chance to win! I would love to win one because my children’s playroom is terribly lacking with regards the flooring and I really want to make the space comfortable for them. Hi! Would love to win a Mohawk carpet for my daughter’s bedroom so that she can have a place to play comfortably on her bedroom floor! Thank you for the chance to make her room extra special. I would love to win one to go in our family room, we are in the process of redoing the flooring and this would be so perfect! Beautiful job. I am following both you and Mohawk on Pinterest. I like both you and Mohawk on Facebook. A new rug would be perfect for my new home! I like you and Mohawk on fb. I follow you on pinterest and have posted many of your awesome recipes. We desperatly need new flooring in our living room. A new rug would get us more time to save up cash to redo the floor. I am sprucing-up my craft room and this carpet would make it look better. My living room is in need of a new carpet, and this would help. I have a Mohawk carpet in my bedroom, need one to liven-up my dining area. I would love to win! Our current area rug has endured 3 children & a lab. It would be awesome to win a fresh, updated one. Thanks for the chance to win. We need new carpet and a large rug would be great. We are currently in the process of remodeling our basement family room and will be putting in new tile flooring in just a few weeks! I love the tile, but I still need a nice area rug to go over top! Google+ follower: Nicole Vosburgh and I +1’ed. We would love a rug. We have not replaced our carpet since we moved into our house almost 19 years ago! Three dogs and five kids later, it is time!! I already subscribe via email :). 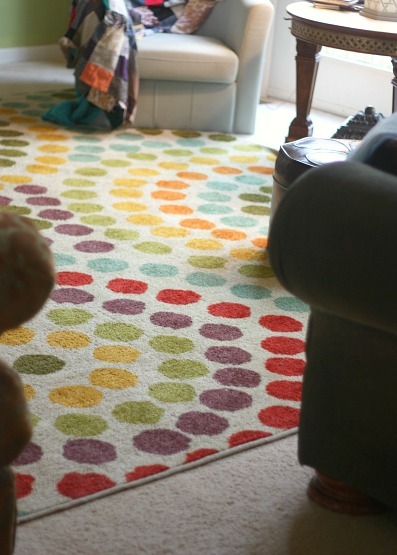 I would like this carpet because I need to update our living room, and Mohawk rugs are such good quality. I want to win to decorate my new apartment!! We are building a new house and are in need of new rugs to protect our beautiful Mohawk hardwoods!! We would live to win this because like you, our flooring has seen lots of activity. Thanks for a chance to win. I want to make my home warm and inviting!!! We just had a new baby and have hard wood floors it would be nice to have some carpeting to make it softer for him! We have hardwood floors throughout our house but would love a little something cozy to soften things up. The Mohawk carpet against the new flooring is perfect! I would love a Mohawk Smartstrand Bound carpet for our family room! Our current area rug is old and too small for the space. Would love a rug for our den. We have hardwoods, but three small children and would love to make the space more inviting and cozy for them. I would love to win a new carpet. We have light colored, old, beat up carpet, but there are too many things we really *need* to purchase (a roof? van? drainage for our barn?) so the carpet will have to wait. A pretty rug would make a huge difference. I would LOVE a rug like this! We are in the process of choosing hardwood flooring for the downstairs. We have a gorgeous rug from Turkey, but it’s my mom’s and she’ll be reclaiming it next year when she moves back to the area. The rug has made a huge difference in the feel of the room and I know when we get the new floors we’ll need something to soften up the space. This kind of rug would be perfect. I have 30 year old carpet in my bedroom. I would like to replace it with laminate. 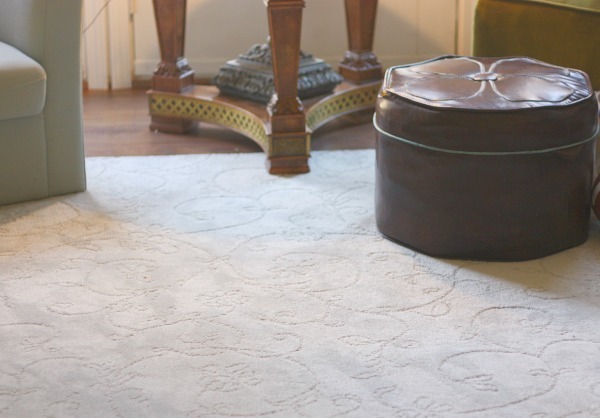 The Mohawk carpet would add beauty and warmth. I would love to win a Mohawk area rug! We have 3 little grandbaby boys (and 1 on the way) and I see lots of play ahead! I would love a bound carpet for my living room! We have hardwoods, but it is a large room with high ceilings and echoes like crazy! Plus I have a one year old who is just beginning to toddle around and often falls on the hard floors 🙁 A rug would be a welcome addition! I would love to win a Mohawk area rug…..I MIGHT gift it…or maybe keep for myself!! I am a subscriber to your blog!! I follow you on FB as Rust Hawk and liked and shared this post. I would love to win a Mohawk Smart Strand Bound Carpet. I have Pergo flooring which also looks like wood. It’s perfect for 3 active boys because it’s so easy to clean and maintain. But our floors get so cold during our Upstate NY winters, especially in our family room. I also have a dining room with a very worn area rug underneath our dining room table. It’s so bad that the corners are ripped and torn and the sides are fraying. But alas, no extra dollars to replace. It’s so bad now that I’m embarrassed to have people over. I keep telling hubby that I rather have nothing under there then to keep looking at the ripped rug. Help! Do you want to know a post that I am about to publish? It’s using your old rug and flipping it over and painting that some neat design. It sounds crazy, but you wouldn’t believe how gorgeous the ones I’ve seen have turned out. Just an idea. You could paint chevron strips or something. I would love to win the carpet to brighten up our dining room. We have very neutral flooring in there now, and it needs some color desperately. I would like to win because we could really use a large area rug to protect our carpet underneath. My son and I moved about 5 months ago and my house is still bare. It has furniture, but nothing personal since it’s a rental. A rug would allow us to make it more of a home after a restart on our lives. I’d love to make my LR pop with a new rug. Can’t wait to see your updates! I would love to win this for our new home! I have liked on FB! I gave it a + on Google +! We are in the process of buying a house that has wood flooring on most of the main level. I would love to win a rug..I’m a carpet girl! We are buying a new home after 15 years in our starter home…with the same old carpet! The new home has tile in the family room, and we love to play on the floor! I would love to win this! We bought our first home last year, and decorating the entire thing with decent/upgraded furnishings/decorations at once is far too expensive, unfortunately. I bought a cheap rug right after moving in for our living room, and it’s pricetag is showing in how it wears. Would love to upgrade to something that will stand up to preschooler/puppy wrestling matches! 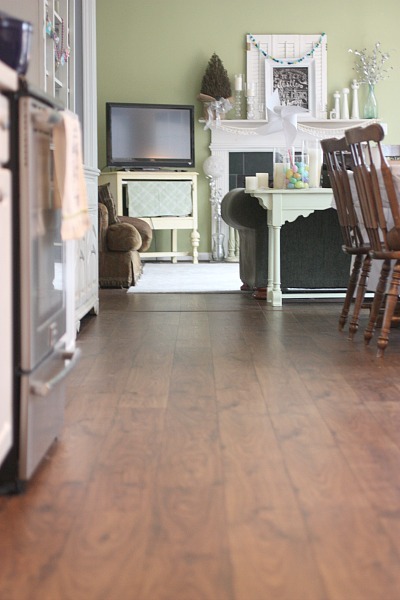 I would love to win a Mohawk carpet to cover the flooring in our kitchen — we could really use new flooring! I also pinned your waffle recipe to my Pinterest board. Yum! I would love a new carpet for our living room! We just switched our living room and dining room, but even though its much cozier this way, the living room floor is looking kind of bare… I also have 4 little kids, so a new carpet is always a good thing! it would be such a wonderful update to our living room! I would love to have a Mohawk carpet as we have been looking for one that size for our office, but haven’t decided on what we like yet! Yes please. I would like a large 10 x 12 rug for my living room. It just makes the room look so much warmer and more interesting. I have entered every way that you mentioned (facebooked both pages, pinterested both pages, and receiving email (except for google plus). I have hardwood floors and could definitely use a fresh and new area rug! Looks great Jen! Hope I win, with four children and two pups we really could use some new carpet! We installed laminate floors the end of last year and really love the so much better than the carpet we had previously. I love your new floors and new look! Enjoy! Your room looks absolutely beautiful! I agree, an area rug does make it more cozy. We have been discussing that same thing; I think you have swayed me! 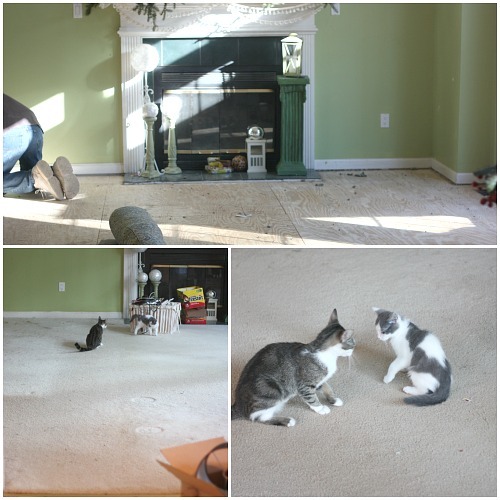 Our terribly old carpet needs upgrading…waiting for the savings to accumulate. An area rug would be just perfect to brighten while we wait! I have a very long living-dining room, with oak wood floors. I would love a bound carpet to define the living area and to add some it-just-feels-good softness under my feet. A carpet would warm up the room visually–and literally. OOH, I would love a Mohawk rug! We have all hard surface floors in our house and we’ve been needing an area rug in our living room for the kids to have a little cozier place to play. Thanks for the giveaway! I’d love the Mohawk area rug for the same reasons you gave. I have an off-white carpeted family room and I’d like to protect that carpet from ware and tear. Thanks for the opportunity! I have been looking for another area rug for my living room since my son was cleaning ashes out of the wood stove on one of those snowy days a couple of months ago and used the wrong container and the ashes melted it and burnt my area rug. I was so sad but what do you do. I just decided that that was the joys of living with teenagers and took it to the garbage. Just glad we didn’t burn down the house. Since then I have been on a mission for a new rug but just haven’t found the right one yet. 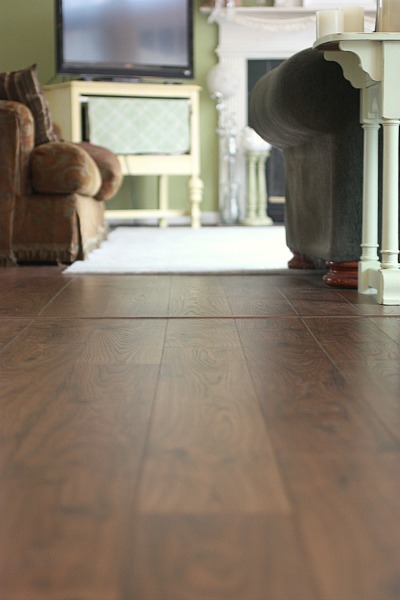 Your new flooring looks beautiful as well as comfortable. I’d love to redo the flooring on our main level so I’d better start saving and researching. 5 kids and 10 years later our carpet is shot. We are renovating our screened porch into a sunroom. A new (and beautiful and durable) carpet would be perfect for this room. Here’s hoping….. I could definitely use a rug in our family room to cover the cold ceramic tile floor! Your space looks beautiful. Hi Jen, was a winner chosen?